Okay… so I could explain to you the deep kabbalistic meaning behind “4”, or I could tell you how well these colors go together, or I could just tell you that this was a wacky idea and someone needs to stop me before I end up with ten 2 in 1s criss-crossed on my head! It may be a little much… but I love it! So awesome! ← Triple Zig Zag Criss Cross Tutorial! It’s Fabulous!!! 💜💜 Shabbat Shalom! It’s beautiful and you carry it off amazingly well. I can’t wear so much bulk in the back of my head though. I wish I could. You look beautiful as always. Your spirit shines out of you in every post. You KNOW what people are going to say though: Aren’t you hot in that? It’s gorgeous, Andrea! Shabbat Shalom to you also. Stop! Before it’s too late! Just kidding. Actually, it doesn’t look like too much at all, it looks gorgeous. I am looking forward to seeing how many you can make work. If you can braid six I bet you can zigzag six! Oh Andrea, when I saw the first picture I actually gasped. I hope to see a tutorial for this gorgeous look. I’m still trying to master 2 scarves, though. You look incredibly beautiful. Shabbat Shalom. It is absolutely beautiful. Yesterday’s triple prompted me to try a 2 scarf zig zag. Don’t know why but I’ve done just about everything else but the zig zag intimidated me for some reason. I actually love love love this even more than the triple! The colors are AMAZING! Love it! I may have to try this in purples for me. Wow, how long did it take you to get those angles so perfect? those colors are so pretty! Just like the sea! You used Pashminas? that is beautiful. I wish I could do that. Stop before you hurt your neck and shoulders with all that weight. Even if you’re wearing ten? Didn’t you ask for us to dissuade you before you tried wearing ten? So don’t do it, because you will hurt your neck. Ten lightweight tichels can get pretty heavy. Especially if you have to tie them semi-tightly. 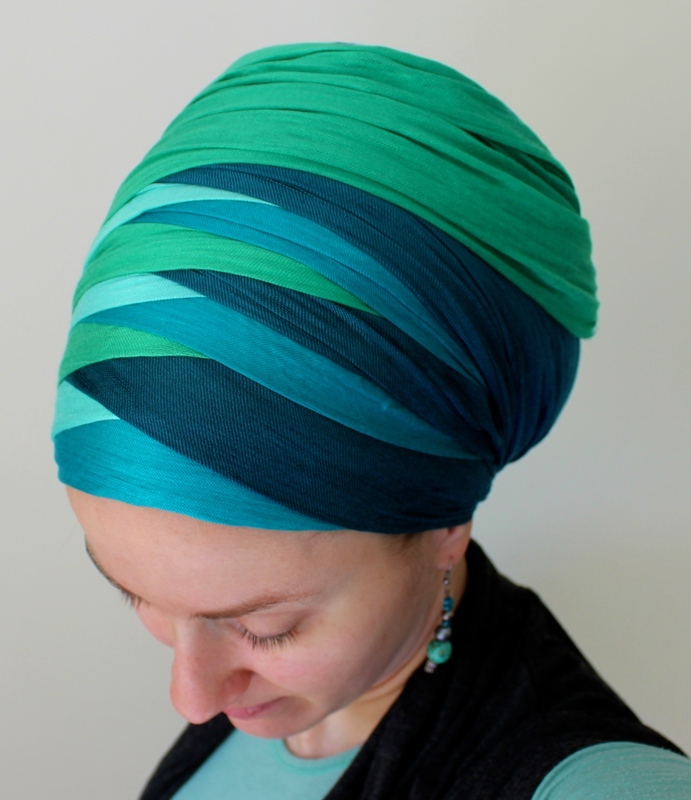 I love wraps all styles always looking for a different ways to wear them. Maybe after I watch your tutorial about 50 times will give it a try. The color choices are really beautiful.